Various types of files are used in making music with Live, from those containing MIDI (see 5.3) and audio (see 5.2), to more program-specific files such as Live Clips (see 5.4) and Live Sets (see 5.5). This chapter will explain everything you need to know about working with each of these file types in Live. However, we should first take a look at Live’s browser, through which most files arrive in the program. Live’s browser is the place where you interact with your library of musical assets: the core library of sounds that are installed with the program, any additional sounds you’ve installed via Ableton Packs, presets and samples you’ve saved, your Ableton and third-party devices, and any folder on your hard drive that contains samples, tracks, etc. The browser display is divided into left and right sections, called the sidebar and the content pane respectively. To resize the sections, drag the divider line horizontally. Working in the browser involves choosing one of the labels from the Collections,Categories or Places sections in the sidebar, and then selecting from the items that appear in the content pane. The Collections labels each have their own assignable color, which you can use to tag items (including folders) that appear in the browser’s content pane. These labels (or “tags”) enable you to quickly organize and access particular browser items (for example, your favorite or most-used items). You can assign Collections labels via a selected item’s right-click(PC) / CTRL-click(Mac) context menu, or by using the number key shortcuts 1 through to 7. Use 0 to reset color assignments. Note that Collections labels can also be assigned to multiple browser items within a selection. Additionally, it is possible to assign a color label to different item “types”. 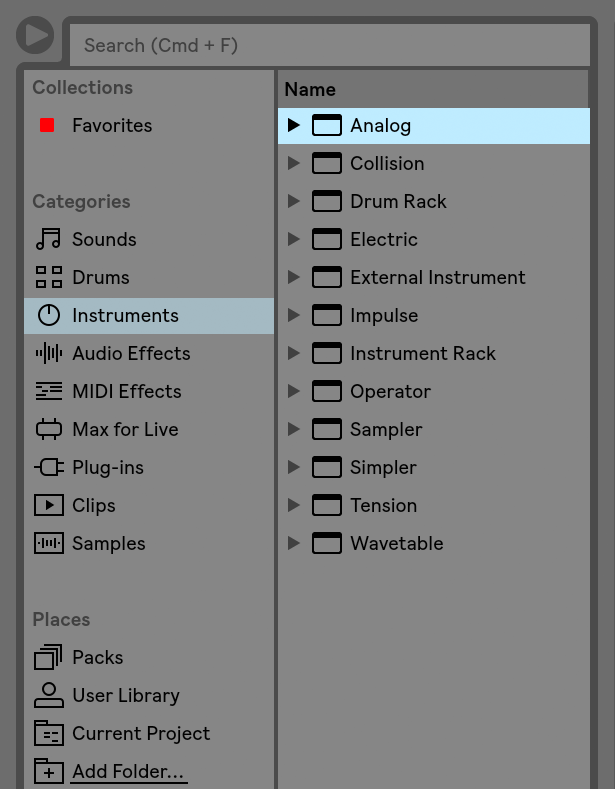 For example, you can assign the same color label to a drum sound, a MIDI effect, and a plug-in. Clicking on a Collections label in the sidebar shows all items tagged with that color. Folders that appear in the Collections labels can be unfolded to show their contents. The Edit Button in the Browser. Each label can be renamed via their right-click(PC) / CTRL-click(Mac) context menu, or by pressing CTRL-R(PC) / CMD-R(Mac). You can choose which labels are visible in the browser, by clicking the Edit button next to the Collections header, and checking the Show/Hide Label option next to each label. Editing Shown and Hidden Collections in the Browser. To exit Edit Mode, press the “Done” button. 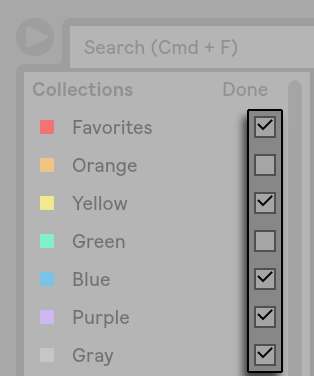 Note that when a hidden unassigned color becomes assigned to a browser item, the Collections label for that color will be shown in the sidebar automatically. However, visible color labels are not automatically hidden if all their assignments are removed. Browser Items and Their Assigned Colors in the Content Pane. In the content pane, square icons indicate the respective color(s) assigned to each item. Note that although multiple colors can be assigned to an item, no more than three of those colors will be shown in the content pane. Drums — all of your drum presets. This includes full drum kits, which are available as Drum Racks, as well as single drum hits, which are delivered as Instrument Racks. Audio Effects — all of your Audio Effect Racks, as well as “raw” Live audio effects devices and presets. MIDI Effects — all of your MIDI Effect Racks, as well as “raw” Live MIDI effects devices and presets. Max for Live — all of your Max for Live (see Chapter 25) devices and presets, as well as any Racks that are built with those devices, organized into Audio Effect, Instrument and MIDI Effect folders. Plug-Ins — your third-party VST and/or Audio Units plug-ins (see 17.2). Clips — all of your Live Clips. Samples — all of your raw audio samples. All results — this section appears after you’ve typed something into the search field. It shows search results for every section of the browser in a single list. Packs — all Packs that come pre-installed with Live, as well as any that you’ve installed yourself. Each Pack appears as a folder in the content pane, which can be unfolded to reveal that Pack’s contents. 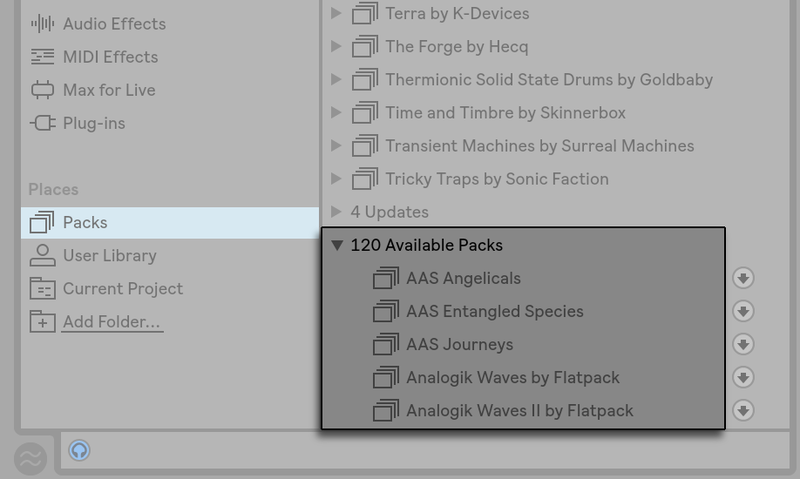 Presets, samples, and Live Clips installed by Packs will also appear in the appropriate Categories labels. The Packs label also shows updates for installed Packs, as well as additional Packs that you can install. Please refer to Downloading and Installing Packs in the Browser (see 5.1.2) for more information. User Library — the User Library is the default location for items you save yourself, including default presets, grooves, your personalized Racks and device presets, your own samples, Live Clips, etc. Files that you save to your User Library will also be available in the appropriate Categories labels. Current Project — all of the files that are contained in the currently active Project (see 5.6). If you’re working on a Live Set that you haven’t yet saved, the current Project refers to a temporary location. any folders from any of your hard drives that you’ve added to Live’s Browser. Scroll up and down in the Browser with the up and down arrow keys, the mousewheel, or by clicking and dragging while holding the CTRL-ALT(PC) / CMD-ALT(Mac) modifier. Close and open folders, or move between the sidebar and content pane with the left and right arrow keys. By default, any previously open folders will close when you open a new one, but you can override this behavior by holding CTRL(PC) / CMD(Mac) while opening new folders. The Packs label in the browser shows you all Packs that come pre-installed with Live, as well as any that you’ve installed yourself. To check for existing updates for your installed Packs, navigate to the Packs label and expand the Updates section. Available Updates for Installed Packs Appear in the Browser. You can also view Packs that you own, but have not installed. These uninstalled Packs appear in the Available Packs section within the Packs label. Downloadable Packs Appear in the Browser. You can download any of these Updates or Available Packs by pressing the download icon next to it. Press the Download Icon to Download a Pack. While the Pack is downloading, the download icon changes to a pause icon that indicates the progress of the Pack’s download. Press the Pause Icon to Pause a Pack Download. The Download Progress Is Indicated in Yellow. Should you need to, you can pause downloads and resume them at a later point. To pause a download, press the pause icon. When a download is paused, the paused icon changes back to a download icon. To resume a paused download, press the download icon again. When the download is complete, you can install the Pack by pressing the Install button. Press the Install Button to Install a Pack. Upon pressing the Install button, Live will display a progress bar that indicates the status of the process. Note that you can download a Pack, pause, resume or cancel a download, or install a Pack by choosing the appropriate command in that Pack’s right-click(PC) / CTRL-click(Mac) context menu. Sometimes you might need to know the size of a Pack before you download and install it. For example, you may have limited space on your hard drive. You can configure the browser to show the size of all Packs that appear in the Updates and Available Packs sections. To do this, right-click(PC) / CTRL-click(Mac) on the Name header in the browser’s content pane and choose the Size option in the context menu. Show or Hide the Size of Packs in the Browser. You can delete an installed Pack via its right-click(PC) / CTRL-click(Mac) context menu. Note that deleted Packs will appear in your list of Available Packs. It is possible to configure Live’s Preferences to show or hide Updates and Available Packs in the browser. To do this, press the Show Downloadable Packs toggle in the Library Preferences. Show or Hide Downloadable Packs in the Browser. Live’s browser allows you to work with your creative tools regardless of where they are installed on your computer. This allows you to, for example, store large sample collections on one or more external drives, and still use the browser to access their contents - there is no need to keep them in a single centralized location. In order to work with your own folders in Live, you must first add them to the browser, either by dropping them directly into Live from the Explorer (Windows)/Finder (Mac) or by pressing the Add Folder button in the browser’s sidebar. After adding a user folder, Live will scan it, which “teaches” the browser about its contents. Following this, it will appear in the Places section of the sidebar. Note: adding a user folder does not actually move the folder to a new location, but simply makes it available in Live’s browser. If you reorganize your drives using Explorer (Windows)/Finder (Mac), Live may not be able to find user folders if they’ve been moved. For example, if a user folder is contained on an external hard drive, and Live is opened without the drive attached, the user folder will still appear in the browser but will be grayed out. You can attempt to find it by using the right-click(PC) / CTRL-click(Mac) context menu’s Locate Folder command, or tell Live to “forget” this folder via the Remove from Sidebar command. You can also use this command to remove folders that aren’t missing, but which you simply don’t want to work with anymore. Live’s browser is equipped with a search field that filters the contents of the selected sidebar label as you type. To search across all locations, press CTRL-F(PC) / CMD-F(Mac). The results will include files that match all search terms, as opposed to any. For example, if you search for “acoustic bass,“ the search will yield all acoustic bass sounds — not all acoustic sounds and all bass sounds. ESC to clear the search field, showing all of the contents of the selected sidebar label. Live allows you to preview samples, clips, and instrument presets in the browser before they are imported into the program. To enable previewing, activate the Preview switch next to the Preview Tab at the bottom of the browser. Hint: You can preview files even when the Preview switch is not activated by pressing Shift-Enter or the right arrow key. You can select Live Clips in the browser to load them into the Preview Tab. 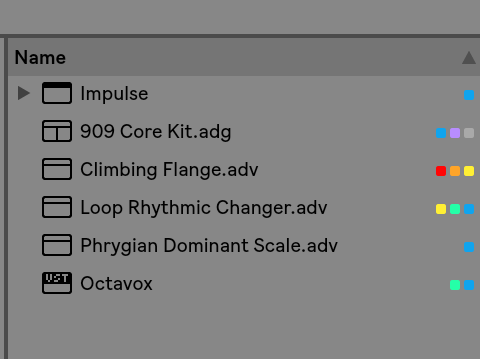 You can also preview Live’s instrument presets in the Preview Tab. When selected, you’ll hear a short audio example of the preset, so you can get an idea of how it sounds before loading it. With the Raw button enabled, files will preview at their original tempo and will not loop. With Raw disabled, Live will try to preview files in sync with the current Set, so that you can better judge which samples will work for you. Please note that scrubbing is not possible when Raw is enabled. The previewing volume can be adjusted using the mixer’s Preview Volume knob. If your audio hardware offers multiple audio outs, you can privately audition, or cue, files via headphones connected to a separate pair of outs — while the music continues to play. To learn how to set up Live for cueing, please refer to the relevant section (see 15.6) of the Mixing chapter. Files can be dragged and dropped from the browser into tracks in the Session or Arrangement View. Dragging and dropping material from the browser into the space to the right of Session View tracks or below Arrangement View tracks will create a new track and place the new clip(s) there. Dropping a Clip to Create a New Track. In the Session View, double-clicking or pressing Enter on a file in the browser will automatically create a new track to the right of the other tracks and load it with the clip. Files can be dropped directly into Live from the Explorer (Windows)/Finder (Mac). Live’s built-in Impulse instrument features eight sample-player slots that can be filled by dropping samples into them. Alternatively, we can click the Hot-Swap button that appears as we move the mouse over a slot. The Hot-Swap Button in an Impulse Slot. The Browser in Hot-Swap Mode. While in Hot-Swap Mode, pressing the up or down arrow key moves to the next file in the content pane, and pressing Enter or double-clicking the file loads it into the Impulse slot (presumably while Impulse is playing incoming MIDI notes). The link between the browser and the instrument will be broken if a different view is selected, or if the Q key or the Hot-Swap button is pressed again. Hot-swapping can also be cancelled with a press of the ESC key or by pressing the close button in the Hot-Swap bar at the top of the browser. When Hot-Swap Mode is re-entered, the browser will show the location of the currently loaded sound and pre-select it. A note on using Variable Bit Rate (VBR) files: Please install QuickTime for decoding purposes if you do not already have it on your system. It can be downloaded from the Apple website*http://www.apple.com/quicktime/download. As Live plays the samples directly from disk, you can work with a large number of (large) samples without running into RAM memory limitations. Please note, however, that you may run into disk throughput problems if your disk is nearly full, and/or (on Windows systems) highly fragmented. Hard drive rotation speed can also affect disk performance. Refer to the section on managing the disk load (see 31.2) for more information. Live can combine uncompressed mono or stereo samples of any length, sample rate or bit depth without prior conversion. To play a compressed sample, Live decodes the sample and writes the result to a temporary, uncompressed sample file. This usually happens quickly enough that you will be able to play the sample right away, without waiting for the decoding process to finish. Note: When adding a long sample to a project, Live might tell you that it cannot play the sample before it has been analyzed. Please see the section on analysis (see 5.2.2) for an explanation. To save computational resources, Live keeps the decoded sample files of compressed samples in the cache. Maintenance of the cache is normally not required, as Live automatically deletes older files to make room for those that are new. 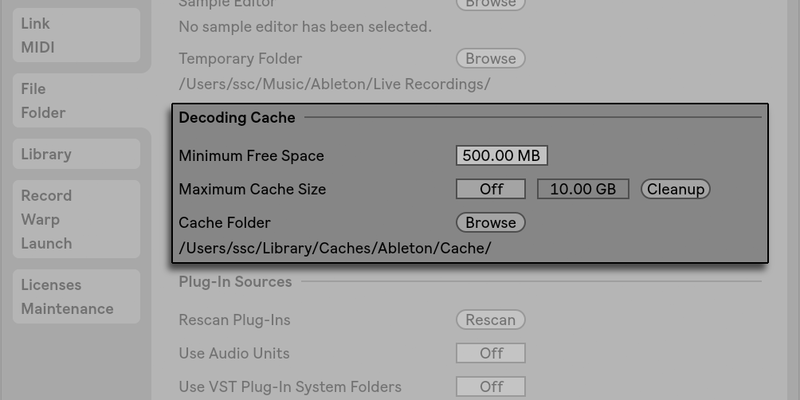 You can, however, impose limits on the cache size using the File/Folder Preferences’ Decoding Cache section. The cache will not grow larger than the Maximum Cache Size setting, and it will always leave the Minimum Free Space on the hard disk. Pressing the nearby Cleanup button will delete all files not being used by the current Live Set. Preferences for the Decoding Cache. An analysis file is a little file that Live creates when a sample file is brought into the program for the first time. 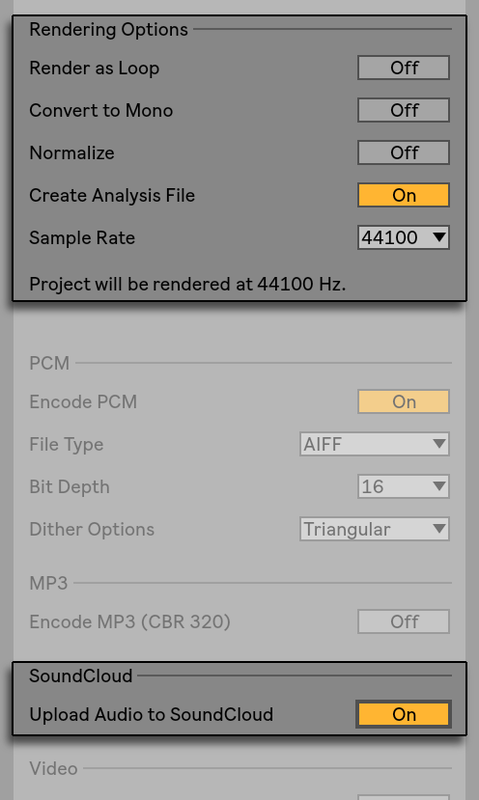 The analysis file contains data gathered by Live to help optimize the stretching quality, speed up the waveform display and automatically detect the tempo of long samples (see “Syncing Longer Pieces”). When adding a long sample to a project, Live might tell you that it cannot play the sample before it has been analyzed. This will not happen if the sample has already been analyzed (i.e., Live finds an analysis file for this sample), or if the Record/Warp/Launch Preferences’ Auto-Warp Long Samples preference (see 9.2) has been deactivated. Clicking the Clip View’s Save button (see 8.2.5) will store the current clip’s settings with the sample’s analysis file. The next time the sample is dragged into Live, it will appear with all its clip settings intact. This is particularly useful for retaining Warp Marker settings with the sample. Storing default clip settings with the analysis file is different from saving the clip as a Live Clip. While analysis files are a handy way to store default information about a particular sample’s settings, keep in mind that you can use different settings for each clip within a Live Set — even if those clips refer to the same sample on disk. But if you drag a new version of the sample into a Live Set, Live will use the settings stored in the analysis file for the newly created clip. The analysis file’s name is the same as that of the associated sample, with an added “.asd“ extension. Live puts this analysis file in the same folder as the sample. Samples that have an .asd file are displayed like this in the browser. Samples without an .asd file look like this. The analysis files themselves do not appear in Live’s browser. Note that you can suppress the creation of .asd files by turning off the Create Analysis Files option in the File/Folder Preferences. All data (except for the default clip settings) can be recreated by Live if the .asd file is missing, however this will take some time for longer samples. The File menu’s Export Audio/Video command allows you to export Live’s audio output as new samples. The resulting files can be used to burn an audio CD for listening purposes or a data CD, which could serve as a backup of your work or be used with other digital audio applications. 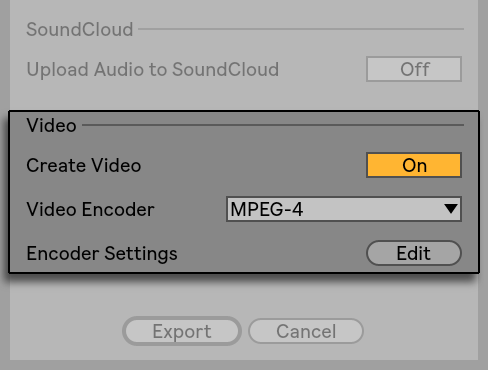 If your set includes video, you can also use the Export Audio/Video command to export this to a new video file, which will be created in the same directory as the rendered audio files. (Note: video export is not available in the Lite and Intro Editions.) You can also upload your exported audio files directly to your SoundCloud account. The Render Dialog’s Selection Options. Master — the post-fader signal at Live’s Master output. If you are monitoring the Master output, you can be sure that the rendered file will contain exactly what you hear. All Individual Tracks — the post-fader signal at the output of each individual track, including return tracks and MIDI tracks with instruments. Live will create a separate sample for each track. All samples will have the same length, making it easy to align them in other multitrack programs. 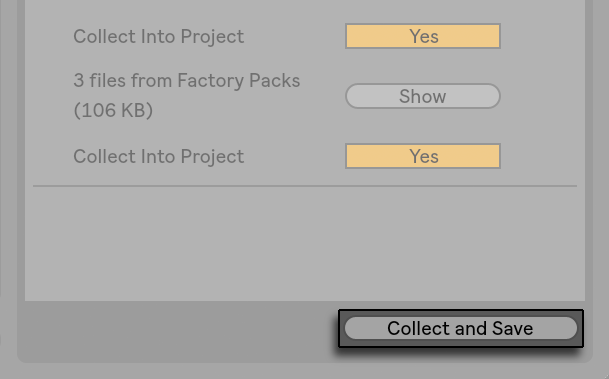 Selected Tracks Only — this is identical to the All Individual Tracks option, but only renders tracks that were selected prior to opening the Export dialog. (single tracks) — the post-fader signal at the output of the selected track. Render Start — sets the position at which rendering will begin. Render Length — determines the length of the rendered sample. 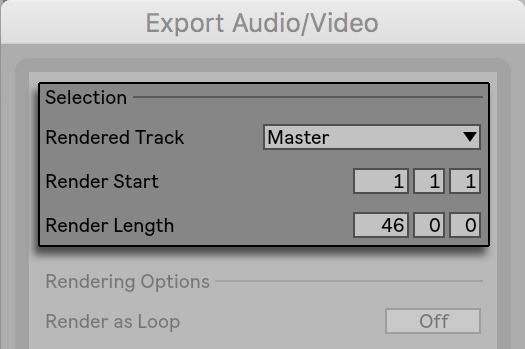 Tip— a fast way to set both the Render Start and Length values is to select a range of time in the Arrangement View prior to invoking the Export Audio/Video command. But remember — a rendered audio file contains only what you heard prior to rendering. So, for example, if you’re playing back some combination of Session View clips and Arrangement material, then that is what will be captured in your rendered file — regardless of which view is active when you render. Render as Loop — If this is activated, Live will create a sample that can be used as a loop. For example, suppose your Live Set uses a delay effect. If Render as Loop is on, Live will go through the rendering process twice: The first pass will not actually write samples to disk, but add the specified delay effect. As the second pass starts writing audio to disk, it will include the delay “tail“ resulting from the first pass. Convert to Mono — If this is activated, Live will create a mono file instead of a stereo file. Normalize — If this is activated, the sample resulting from the render process will be normalized (i.e., the file will be amplified so that the highest peak attains the maximum available headroom). Create Analysis File — If this is activated, Live will create an .asd file that contains analysis information about the rendered sample. If you intend to use the new sample in Live, check this option. Sample Rate — Note that your choice of sample rate works as follows: if you select a sample rate equal to or higher than the rate you’re using in your project (as set in the Audio tab of Live’s Preferences), Live will export in a single step, at the sample rate you’ve chosen in the Export dialog. If you export at a sample rate that is lower than your current project sample rate, Live will first export at the current project sample rate and then downsample the file in a second step using a high-quality process. Note that this may take a few moments. Upload Audio to SoundCloud — If activated, a helper application will launch that will allow you to upload your exported audio file to SoundCloud. Encode PCM — If activated, a lossless audio file is created. File Type —WAV, AIFF, and FLAC formats are available for PCM export. Encode MP3 — If activated, a CBR 320 kbps MP3 file is created. 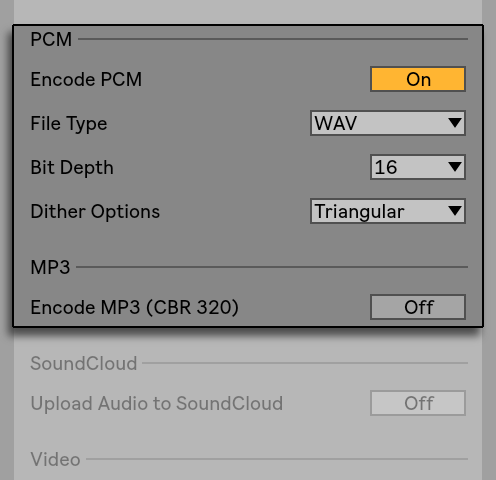 It is possible to export PCM and MP3 simultaneously. If neither toggle is enabled, the Export button will be disabled. Create Video — If this is activated, a video file will be created in the same directory as your rendered audio. Note that this option is only enabled if you have video clips in the Arrangement View. Also, it is not possible to only render a video file — enabling video rendering will always produce a video in addition to rendered audio. Video Encoder — This chooser allows you to select the encoder to use for the video rendering. The choices you have here depend on the encoders you have installed. Video Encoder Settings — This button opens the settings window for the selected encoder. Note that the settings options will vary depending on the encoder you have chosen. Certain encoders have no user-configurable options. In this case, the Edit button will be disabled. Once you’ve made your selections and clicked Export to begin the rendering process, audio rendering will begin. After the audio rendering is complete, the video will be rendered. Note that, depending on the encoder used, video rendering may occur in more than one pass. Live will display a progress bar that will indicate the status of the process. Unless you’ve specified a special window size or aspect ratio in the encoder settings, the rendered video file will play back exactly as it appeared during real time playback in Live. The video file will also contain the rendered audio. For more information about working with video in Live, see the chapter on video (see Chapter 21). Waiting for External Devices to Become Silent. Skip — By default, Live will wait for ten seconds before starting a real-time render. 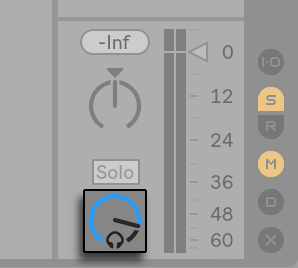 This should allow any sound from external devices to fade out, but if you need more time (for example, if you’re waiting for a long reverb tail), you can increase the wait time by typing a new number in the number box. On the other hand, if you’re sure that your external devices aren’t making any sound, you can speed the process along by pressing “Skip,“ which will start the render immediately. Auto-Restart on drop-outs — Rendering in real-time requires somewhat more CPU power than non-real-time rendering, and in some cases drop-outs (small gaps or glitches in the audio) can occur. Live detects when drop-outs happen, and rendering will start again from the beginning if the Auto-Restart option is enabled. Restart — manually restarts the rendering process. Cancel — stops the rendering process and deletes the partially rendered file. The number of rendering attempts (if there has been more than one) will also be listed in the dialog box. If you find that dropouts and restarts keep happening, you should close other running applications to allow more processing power for rendering. Please see the chapter on computer audio resources (see Chapter 31) for more tips on improving performance. A MIDI file contains commands that prompt MIDI compatible synthesizers or instruments, such as Live’s Simpler, to create specific musical output. MIDI files are exported by hardware and software MIDI sequencers. Importing MIDI files into Live works differently than with samples: MIDI file data is incorporated into the Live Set, and the resulting MIDI clips lose all reference to the original file. MIDI files appear with a special icon in the browser. A MIDI File in the Browser. You can import MIDI files by using the browser or the Create menu’s Import MIDI File... command. Note that when using the Import MIDI File... command in the Arrangement View, the file will be inserted at the Insert Marker position. When using the command in the Session View, the file will be inserted in the currently selected clip slot. Live MIDI clips can be exported as Standard MIDI files. To export a MIDI clip, use the File menu’s Export MIDI Clip command. 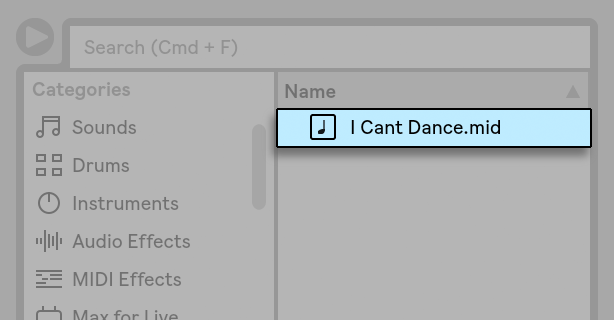 This command will open a file-save dialog, allowing you to choose the location for your new MIDI file. Exporting a MIDI file is different from saving the clip as a Live Clip. Individual audio or MIDI clips can be exported to disk in the Live Clip format for easy retrieval and reuse in any project. Audio clips only contain references to samples on disk (rather than the audio data itself), so they are very small, which makes it easy to develop and maintain your own collection. To save a clip from the open Live Set to disk, simply drag it to the Places section of the browser and drop it into the Current Project or any user folder. For audio clips, Live will manage the copying of the clip’s sample into this new location based on the selection in the Collect Files on Export chooser (see 5.8.1). You can then type in a new name for the clip or confirm the one suggested by Live with Enter. A Live Clip in the Browser. Live Clips are a great way of storing your ideas for later use or development, as they save not only the original clip, including all its clip and envelope settings, but also the original track’s devices. In order to recreate a Live Clip’s device chain, either drag it into a track containing no clips or devices, or drag it into the space in the Session or Arrangement View containing no tracks. Note that Live Clips that are imported into tracks already containing devices or clips will appear with their clip settings but not their devices. You could, for instance, drop a bassline Live Clip on an existing track that drives a bass instrument, rather than creating a new track. Clips belonging to any Live Sets already on disk are also Live Clips. Please see the section on merging Sets (see 5.5.2) for more on this topic. Note that storing default clip settings with a sample’s analysis file is different from saving a Live Clip. The default clip in the .asd file annotates the sample with sensible default values (warp, gain and pitch settings) so that it will play in a defined way when it is added to a Set. Live Clips, on the other hand, are stored on disk as separate musical ideas. For example, you could create a number of variations from the same audio clip by using different warp, pitch, envelope and effect settings, and store them all as separate Live Clips. In the browser, you could then independently sort and preview these clips, even though they are all referring to the same source sample. The type of document that you create and work on in Live is called a Live Set. 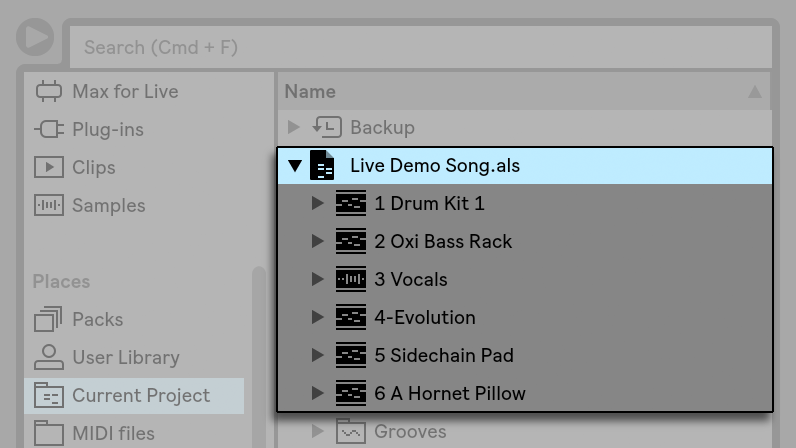 Think of this as a single “song.“ Sets must be saved inside projects, so that Live can keep track of and manage all of the various components of the Live Set: Live Clips, device presets, any samples used, etc. Use the File menu’s New Live Set command to create new Live Sets, and the Open Live Set or Open Recent Set command to open existing ones. In the browser, you can double-click or press Enter on a Live Set to open it. The File menu’s Save Live Set command saves the current Live Set exactly as it is, including all clips and settings. Live makes it easy to merge Sets, which can come in handy when combining work from different versions or pieces. 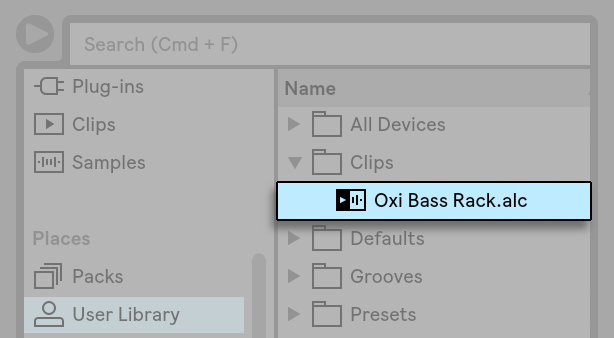 To add all tracks (except the return tracks) from one Live Set into another, drag the Set from the browser into the current Set, and drop it onto any track title bar or into the drop area next to or below the tracks. The tracks from the dropped Set will be completely reconstructed, including their clips in the Session and Arrangement View, their devices, and their automation. Session View Drop Area for Importing Live Sets. Arrangement View Drop Area for Importing Live Sets. 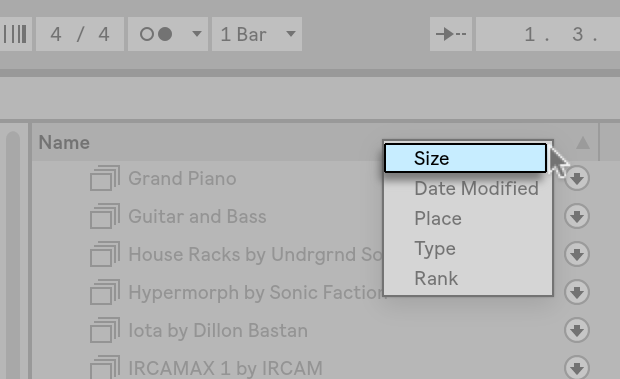 If you prefer to import individual tracks from a Set, you can unfold the Live Set in the browser just as if it were a folder. Unfolding a Set to Reveal its Contents. You can now drag the individual tracks and drop them as described at the beginning of this section. Any grooves (see Chapter 12) that were saved with your Set are also available as a folder within the unfolded Set. You can also drag Group Tracks (see 15.3) and nested Group Tracks from Live’s browser. Group Tracks can be expanded in the browser, allowing you to load an individual track from within. Revealing the Session View Clips Contained in a Set. You can browse, preview and import Session View clips from the Set as if they had been stored as individual Live Clips. This means that any Live Set can serve as a pool of sounds for any other, suggesting creative reuse and crossover. You can export a selection of Session View clips as a new Live Set by dragging them to the browser. To export a Set, first click and drag, or use the Shift or CTRL(PC) / ALT(Mac) modifiers, to select more than one Session View clip. Then, simply drag and drop the clips into the Current Project or any user folder, where you can either confirm Live’s suggested name or type in one of your own. Preset devices, like EQs and Compressors, in every track. Computer key mappings (see 27.2.5). To delete your custom template Set, press the Clear button in the File/Folder Preferences. This will restore the built-in factory template. 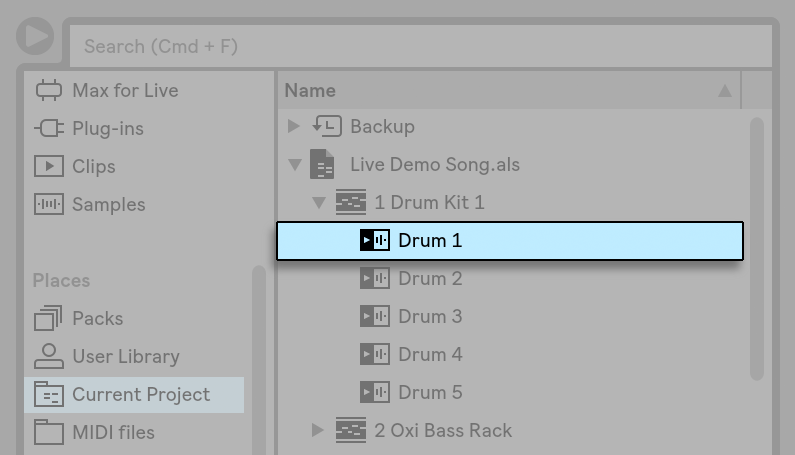 You can also temporarily load the built-in factory template by holding Shift while selecting New Live Set from the File menu. Replace a file — Dragging a file from the browser and dropping it on an entry in the list makes the Live Set reference the new file instead of the old one. For samples used in audio clips, Live retains the clip properties; the Warp Markers are kept if the new sample has the same or a greater length as the old sample and discarded otherwise. 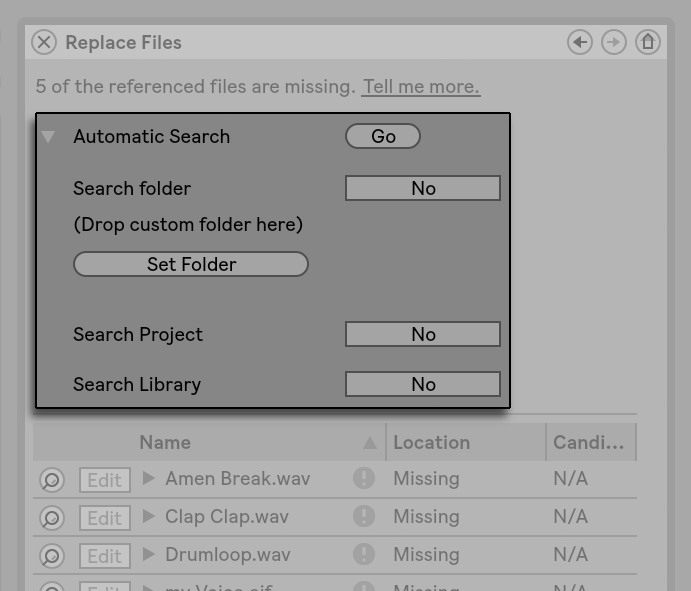 Please note that replacing a sample will change all clips in your set that reference this sample. Every Entry in the File Reference List is a Drop Target for Files. 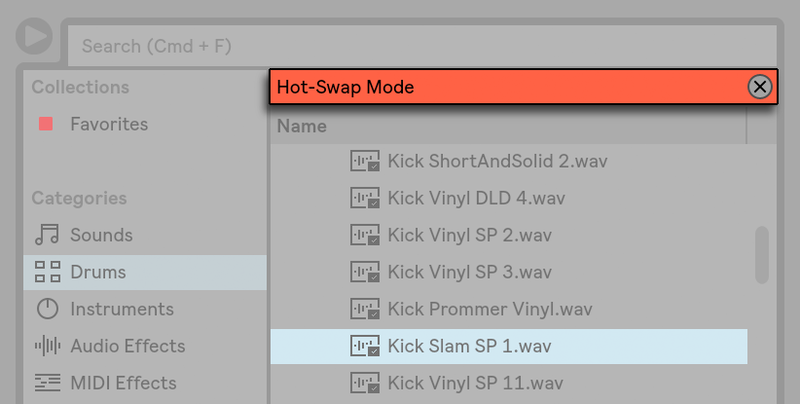 Hot-swap files — Using the Hot-Swap button at the left-hand side of each entry, you can quickly browse through alternatives for the file that is currently being referenced. This is like dragging files here, only quicker. The File Reference List’s Hot-Swap Button. Edit a referenced sample — using an external application (which can be chosen in the Preferences’ File/Folder tab). Clicking the Edit button will open the referenced sample in the external application. The sample will remain offline as long as the Edit switch is engaged. For samples used in audio clips, the current set of Warp Markers is retained only if the sample length remains the same as before. 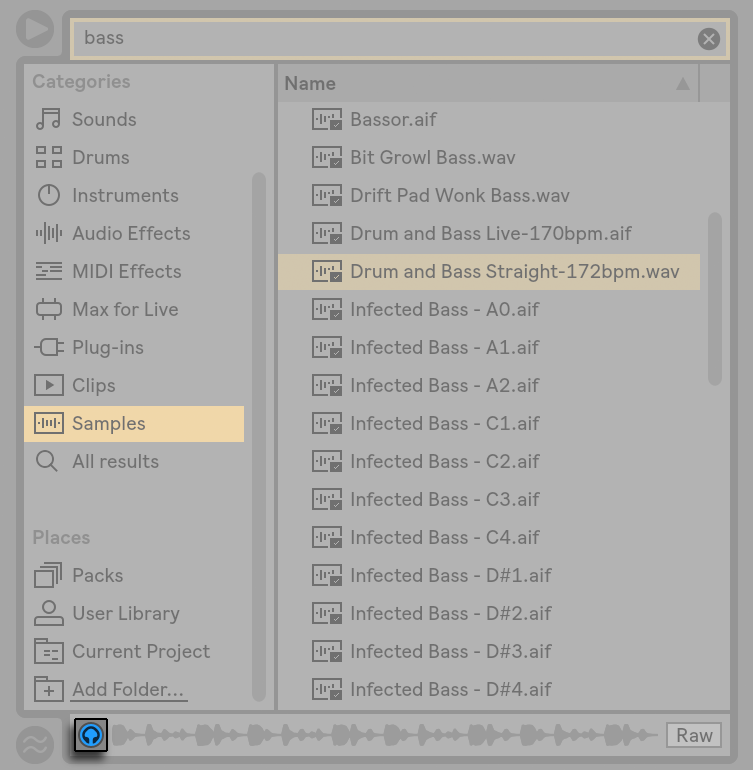 Note that the Edit button is only available for samples, not for other types of files such as Max for Live devices (see Chapter 25). The File Reference List’s Edit Switch. View a file’s location — The Location column states if a file is missing (see 5.7), or if it resides in your User Library, a Project or somewhere else (“external“). When unfolded, the entry shows the specific places in the Set where the file is used. The File Reference List’s Location Column. A Live Project is a folder containing Live-related files that belong together. Consider, for example, work on a piece of music: You start out with an empty Live Set; you record audio and thereby create new sample files; you drag in samples from collections; you save different versions of the Live Set along the way so that you can go back and compare. Perhaps you also save Live Clips or device presets that “belong“ to this particular musical piece. The project folder for this Live Project will maintain all the files related to this piece of music — and Live’s File Manager will provide the tools you need to manage them (see 5.6.3). A Live Set and its Recordings in a Live Project Folder. 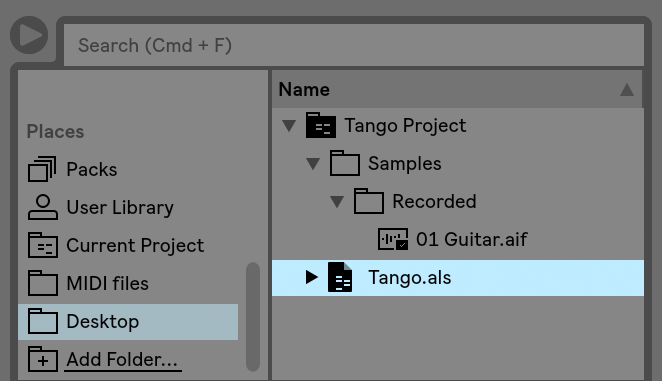 The project folder (“Tango Project“) contains the Live Set (“Tango.als“) and a Samples folder, which in turn contains a Recorded folder with two samples in it. Note that the current Project is also indicated in the title bar of Live’s application window. Next, we record another track into our Project. We save the modified version of the Live Set under a new name so that we do not lose the previous version. Accepting the Save As command’s default suggestion, we store the new version of the song in the Tango Project folder. A Second Version of the Live Set Has Been Added to the Project. The Tango Project now contains two Live Sets, and its Samples/Recorded folder contains the samples used by both of them. And now for something completely different: We choose the File menu’s New Live Set command and record a samba tune. As this has nothing to do with our tango dabblings, we decide to save it outside the Tango Project folder, say on the Desktop. 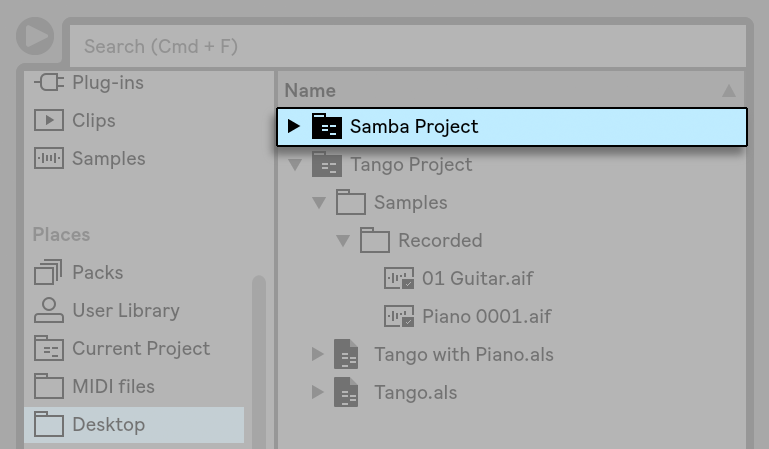 Live creates a new project folder named Samba Project next to Tango Project. A New Project Was Added Next to Tango Project. So far we have seen how to create Live Projects and save versions of Live Sets into them. How do we open a Project? Simply by opening any of its contained Live Sets. 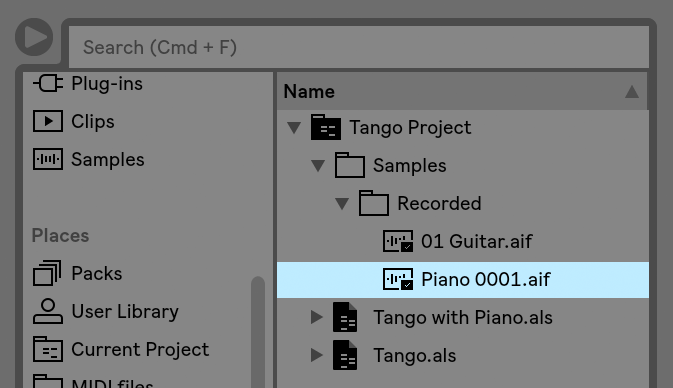 Double-clicking “Tango with Piano.als“ opens that Set and the associated Project — as displayed in Live’s title bar. A New Project Was Added by Saving a Live Set Outside its Original Project. Note that the new project folder has no Samples folder (yet). 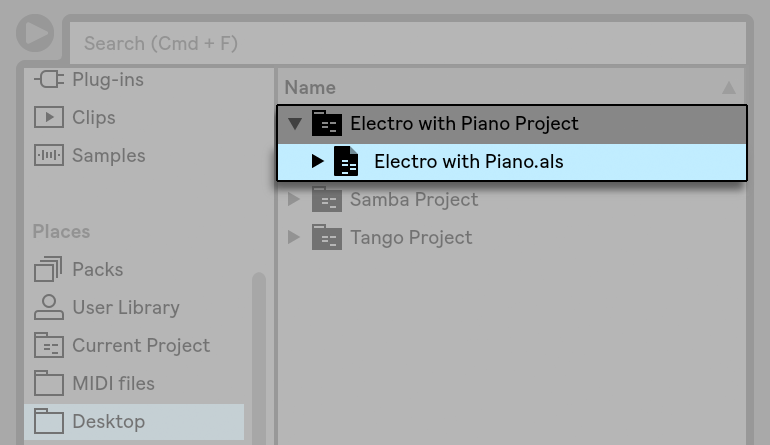 “Electro with Piano.als“ is still referencing the piano sample from the original Tango Project. There is nothing wrong with this except for when the Tango Project is moved away or deleted; then “Tango with Piano.als“ will be missing samples. You can prevent this by collecting external files (see 5.8). Even after the fact, Live’s tools for searching missing files (see 5.7) can help solve this problem. There is actually no need to keep a Project’s Live Set exactly one level below the Project itself. Within a project folder, you can create any number of sub-folders and move files around to organize them as desired, although you many need to use the File Manager to “teach“ the Project about the changes you’ve made (see 5.12.2). In general, Live will do what it can to prevent situations such as orphaned (Project-less) Live Sets, which have the potential of confusing both the user and Live’s file management tools. It cannot, however, control situations in which Sets or files are moved out of order and become disorganized via the Explorer (Windows)/Finder (Mac). A note for users of older Live versions: Live does not allow overwriting Live Sets that were created by older major versions to prevent compatibility problems. Instead, you will be requested to “Save As...“. Doing this will insure that the newly saved Live Sets reside in project folders. 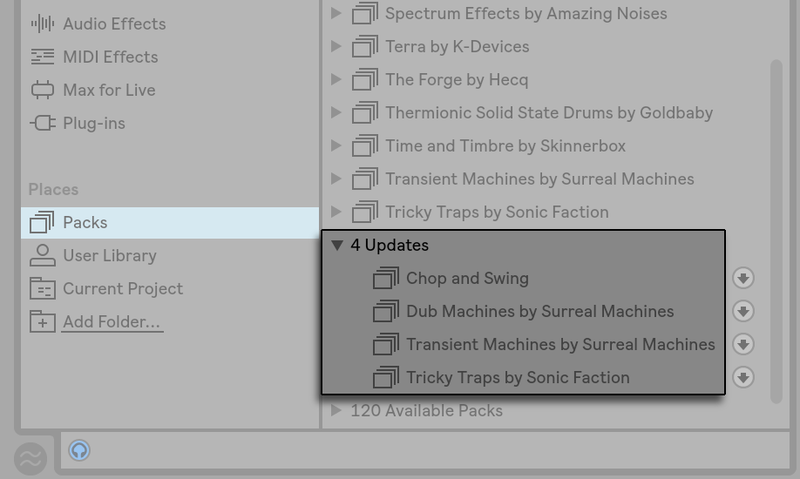 By default, new instrument and effect presets are stored in your current Project. At times however, it may make more sense to save a preset to another folder or to your User Library, so that you can access them from other Projects. You can drag a preset between folders after saving it (see “Saving Presets”), or simply drag the title bar of the device over a folder in the sidebar, wait for the content pane to open, and then drop it into the content pane, adding it to the folder. 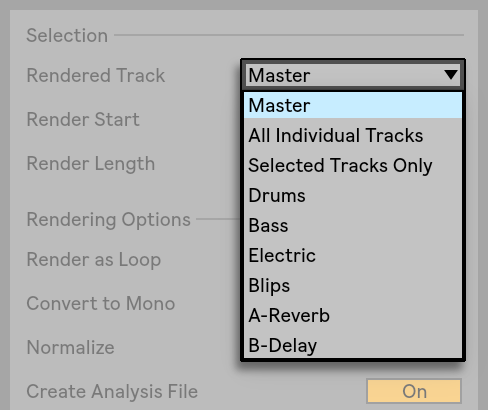 When saving presets that contain samples to a new location, Live may copy the samples depending on the settings in the Collect Files on Export chooser in the Library Preferences. You can then type in a new name for the device or confirm the one suggested by Live with Enter. If you load a Live Set, Live Clip or preset that references files which are missing from their referenced locations, Live’s Status Bar (located at the bottom of the main screen) will display a warning message. Clips and instrument sample slots that reference missing samples will appear marked “Offline,“ and Live will play silence instead of the missing samples. Live’s File Manager offers tools for repairing these missing links. Click on the Status Bar message to access these. (This is actually a shortcut for choosing the Manage Files command from the File menu, clicking the Manage Set button, and then clicking the Locate button found in the Missing Files section.) The File Manager will present you with a list of the missing files and associated controls. The File Manager’s List of Missing Files. To manually fix a broken file reference, locate the missing file in the browser, drag it over to the File Manager and drop it on the respective line in the list of missing files. Note that Live will not care if the file you offer is really the file that was missing. Live offers a convenient automatic search function for repairing file references. To send Live on a search, click the Automatic Search section’s Go button. To reveal detailed options for guiding the automatic search function, click the neighboring triangular-shaped button. Automatic Repair Options in the File Manager. Search Folder — includes a user-defined folder, as well as any sub-folders, in the search. To select the folder, click the associated Set Folder button. Search Project — includes this Set’s project folder in the search. Search Library — includes the Live Library in the search. No candidate found — you can choose another folder and try again, or locate the sample manually. One candidate found — Live accepts the candidate and considers the problem solved. Several candidates found — Live requires your assistance: Click the Hot-Swap button (i.e., the leftmost item in every line of the list of missing files) to have the browser present the candidates in Hot-Swap Mode. You can now double-click the candidates in the browser to load them, as the music plays if you like. Unfold the triangular-shaped fold button in the External Files section. Options for Collecting External Files. A Yes/No toggle for engaging or disengaging collection. Note: Make sure to confirm your choices by clicking the File Manager’s Collect and Save button! The File Manager’s Collect and Save Button. The File menu’s Collect All and Save command is a shortcut that collects and saves all external files referenced by the current Set, including those from Live’s Core Library or other installed Packs. Note that this can cause a lot of copying, especially if your Live Set uses large multisample collections! Always, the default setting, will copy files into the same folder as the clip, preset, or track without notification. When Ask is selected, Live provides a dialog box with options for copying files. Never means that files will not be copied when saving. The User Library — choose the Manage Files command from the File menu; then click the Manage User Library button. The current Live Project — choose the Manage Files command from the File menu; then click the Manage Project button. Any Live Project — right-click(PC) / CTRL-click(Mac) on a Project in the browser’s content pane, and choose the Manage Project option. Any selection of Live Sets, Live Clips, Live Presets — right-click(PC) / CTRL-click(Mac) on the respective items in the browser, and choose the Manage Files command. Remember to click the Collect and Save button at the bottom of the File Manager when you are finished. Otherwise your changes will be discarded. Live’s File Manager can find the unused files in a Project for you. You can then review them and decide to delete them individually or collectively. 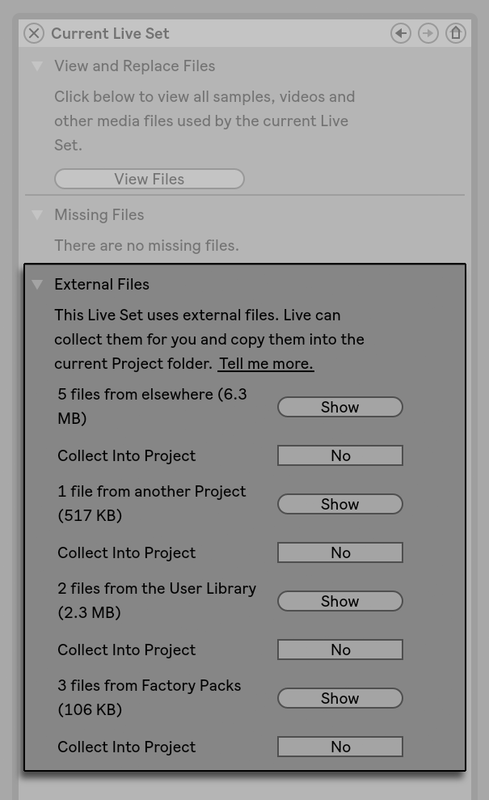 When searching for “unused“ files, Live will inspect each file in a Project folder, checking if it is referenced by any of the Live Sets, Live Clips or device presets in the Project. If not, the file is regarded as unused — even if other Projects or programs still use it. To find the unused files for the currently open Project, choose the Manage Files command from the File menu, click the Manage Project button, and then click on the triangular-shaped fold button next to “Unused Files“ to access a summary and the Show button. Clicking the Show button makes the browser list the unused files; there, you can preview samples (see “Previewing Files”) and delete them if you like. Note you can also find the unused files from the Library: choose the Manage Files command from the File menu, then click the Manage Library button, and then see the Unused Files section. Last but not least, you can find the unused files for all Projects found in a specific folder (and its sub-folders): right-click(PC) / CTRL-click(Mac) on a folder in the browser and choose the Manage Projects command, then see the Unused Files section. Live inspects each Project individually and labels a file unused even if another Projects in the same folder does use that file. To prevent losses, you may want to first collect the files into their respective Projects and then purge the Projects of unused files. Live’s File Manager provides the option of packing a Live Project in Pack format for convenient archiving and transfer. To do this, choose the Manage Files command from the File menu, click the Manage Project button, and then click on the triangular-shaped fold button next to “Packing.“ Click the Create Pack button to bring up a file-select dialog where you can specify the name and location of a new Pack file. Creating a new Pack from a Project does not affect the Project. If you want the Project deleted, you can delete it using the browser. Live employs lossless compression techniques to minimize the file size of Packs. Depending on the audio materials in a Project, this saves up to 50 percent in file size. To unpack a Pack (i.e., to restore the original Live Project), double-click the Pack file (.alp), drag it into the Live main window, or locate it via the File menu’s Install Pack command. Live will then install the Pack to its default location and it will appear in the Packs label in the browser. A Project is automatically created whenever you save a Live Set, except when you save it into a preexisting Project. You can save presets directly to the current project by dragging from the device’s title bar and dropping into the Current Project label in the browser. You can then use the File Management tools, collect any referenced samples, etc. If you’d like to work on different versions of the same Live Set, save them into the same Project. This will usually be the Project that was created when you saved the first version of the Live Set. If a Project contains multiple Live Sets it will only collect one copy of any samples used by the various versions, which can save disk space and help with organization. You can save Live Sets anywhere you want, but saving to pre-existing Project folders can cause problems, and should be reserved for special cases. You should only save a Live Set to an existing Project if it is somehow related to the Project — for example, an alternate version of a song that’s already in the Project.